Dress up sidewalks, entranceways and parks with concrete flower pots built to exceed any industry standard for strength and durability. 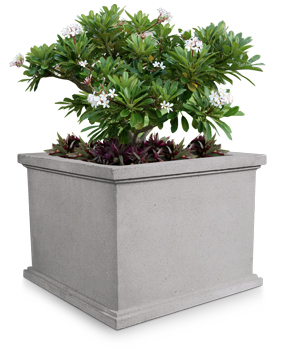 Large capacity flower pots are perfect for planting bigger plants and various arrangements of flowers since they are able to support large root systems. Concrete acts as an insulator during colder weather protecting the roots from sudden temperature drops, and best of all - concrete is a natural theft deterrent.